The Eastern Shore Trail is a 24-mile multi-use path of varying widths and surfaces constructed for pedestrians and slow cyclists. Most of the trail follows the eastern shore of Mobile Bay along Scenic Highway 98 through Daphne, Montrose, Fairhope, Point Clear, the Y-Weeks Community and Barnwell to its end at the Weeks Bay Reserve. The trail starts at the Gator Alley boardwalk that travels under I-10 in Daphne. Parking is available on North Main Street at Gator Alley. Location: Gator Alley at I-10 in Daphne, Alabama to Weeks Bay Reserve on Scenic Highway 98 in Baldwin County, Alabama. To reach the beginning of the off road trail in Daphne at Gator Alley - From Mobile, AL cross Mobile Bay on US 90 Battleship Parkway or I-10 east to exit at the first Daphne exit. From Pensacola, head west on I-10 and exit at the last Daphne exit before crossing Mobile Bay. 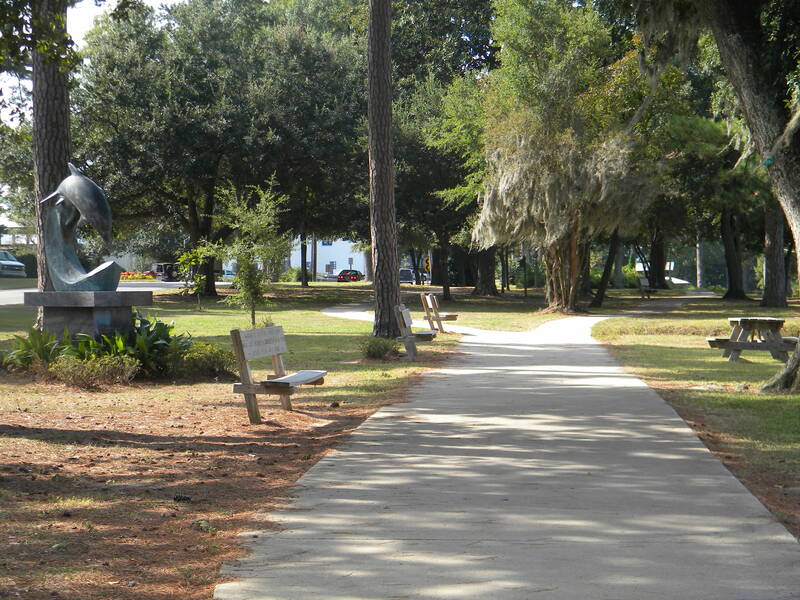 Parking is available at Gator Alley on North Main Street, Daphne. Ever since 1995 a non-profit grass roots group calling themselves the Baldwin County Trailblazers has engaged in a campaign to develop a continuous multi-purpose trail that follows the eastern shore of Mobile Bay in Baldwin County, Alabama. 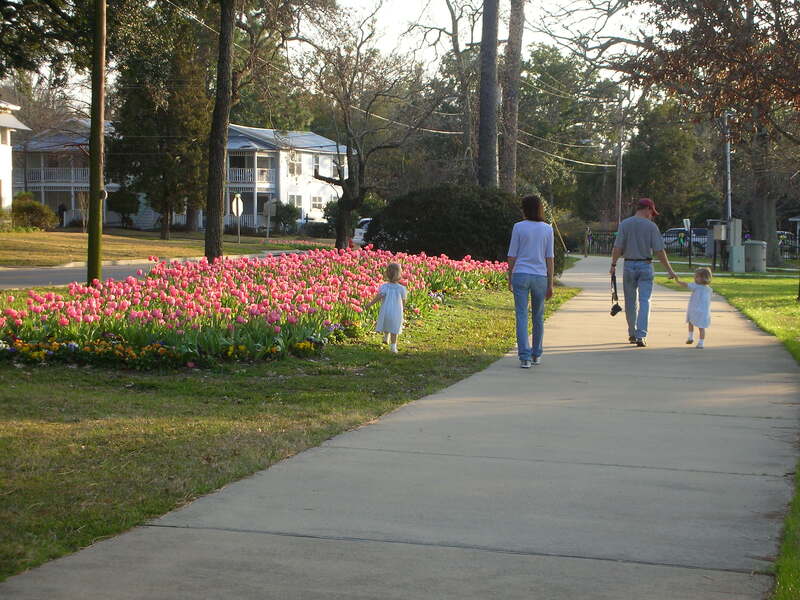 Their initial challenge was to create the public appetite for sidewalks in small communities that had "gotten along just fine without them," then to connect them all. They wrote the grants and helped raise matching funds. In unincorporated areas they worked with county commissioners and the local press again selling a product that had yet to exist. Well known national trail enthusiasts Dan Burden, Jeff Speck, and Ed McMahon appeared at Trailblazer conferences, providing guidance and encouragement. Today a wide variety of trails constitute the Eastern Shore Trail ...many waterfront, some historic, wilderness and small town, both off road and paralleling roads. One dubbed "Gator Alley" tunnels under an interstate highway giving hikers a close look at alligators and giant turtles swimming below in d'Olive Creek or sunning themselves on its banks. These trails are largely constructed of concrete or asphalt but because of the wide variation in grade a lot of elevated boardwalks and high-rise bridges, both wooden and metal, are also common. 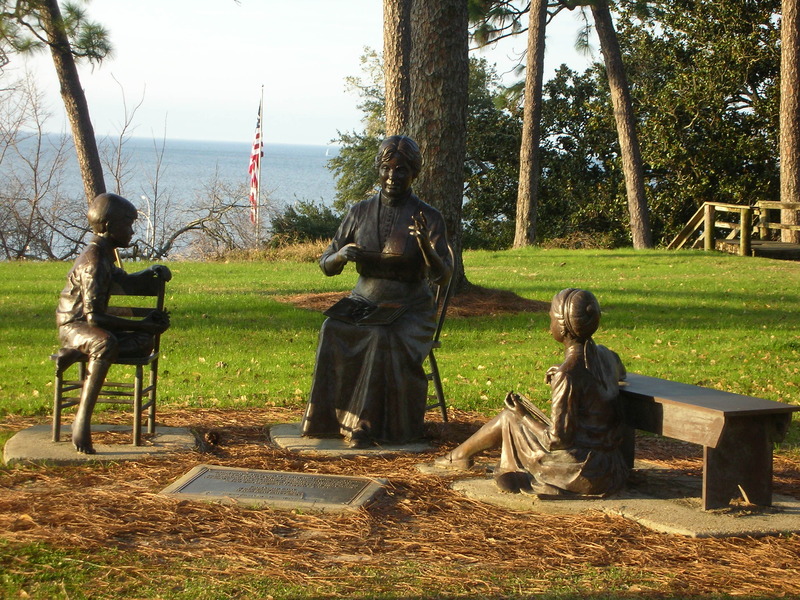 For non-residents such as our winter snowbird friends there's much to see and do from the art galleries, street corner gardens and Single Tax Colony Museum in downtown Fairhope to the historic but totally updated Grand Hotel Marriott Resort at Point Clear. Perhaps the most fun of all is a stroll out on Fairhope's half mile municipal pier to check out the fishermen's luck, follow a sailing regatta in progress, or to marvel at windsurfers skimming by on a strong tail wind. Then there are the band concerts on the bluff overlooking the pier, the Rose Garden, duck ponds and swimming in the Bay off sandy beaches. Dog walkers on Eastern Shore Trail. Photo by Sherry Sullivan. Trail walker and dog stopped at interpretive sign. Photo by Sherry Sullivan. Runners on trail. Photo by Sherry Sullivan. 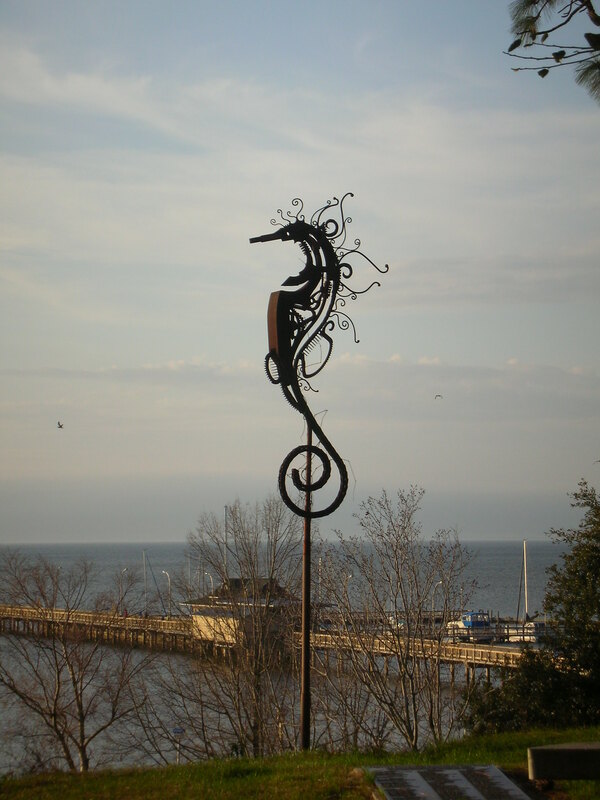 Listen and learn from the trailside sculptures. Photo by Sherry Sullivan. Marietta Johnson statue. Photo by Sherry Sullivan. Seahorse metal sculpture. Photo by Sherry Sullivan. Tulips in bloom. Photo by Sherry Sullivan. Orange Street pathway. Photo by Sherry Sullivan.